After a weekend with the parents it was back to Parrsboro to visit with the gang and get some more flying in. We started off by detouring to High Head on Monday, on the way to Parrsboro, which is an inland thermic site just north of the Mount Wentworth ski hill. Launch is about 1000' and faces north, so you need a light north wind to make things work. When we got there it was too west on the ground (there is a windmill nearby) and we thought it would be too cross to launch safely, and it tends to get windy there. So onwards to Parrsboro where we met up with Trevor (pilot from Moncton) at Hidden Falls. It was NW there but we decided to go up anyways and take a look-see. Hidden Falls is really SW so a NW wind is kinda over the back, and the wind ribbons we erected were certainly showing that. After a while of watching it looked like the cycles were switching around so Alex laid out and launched, and we watched him attempt a few turns before landing on the road below next to the blueberry fields. He reported it wasn't really that nice flying so Trevor and I went back down. Well, onwards to the Golf course and it was crossing from the south as Alex got his glider out, so we tried a site east of there, where it was nil wind. OK, back to the golf course where it was now SW so we figured it was just turning around so we went to good old Fox River, which works well in a SW.
At Fox River it was really light, and Alex (whose glider was just piled in the back seat of the car by now, so of course he was launching first with his glider already ready to go!) and Trevor were only able to do one upwind pass before sinking out on the downwind pass, landing on the beach below. At this point it was getting late and not likely to pick up, so we finally packed up Alex's glider and headed back to the cabin. The forecast for the next morning was for SE, so we were anxious to fly West Bay before it blew out as the storm moved in. Up the next morning and it was indeed easterly already, so we called Brian and Michael and arranged to meet at West Bay. At launch by 9am (which is a lawn!) and launching soon thereafter into nice smooth east winds. Usually at West Bay it's SE, which means you can soar the big cliffs to the south in addition to Cape Sharp to the east. But today it was too east for that which meant flying Cape Sharp only, which is pretty spectacular in itself. It's a jutting cliff out into the Bay of Fundy, about 100m high, and has no LZ's except for the beach back at the West Bay beach. If you get blown over the back at the Cape it's not fun as there is nothing but cold Atlantic seawater for 20 km and you reach the other side of the Bay of Fundy. So you have to keep an eye on your ground speed and the changing wind and tide conditions! We all had a fun time flying, top-landing, warming up (the neighbour that lives on the launch was home and made us tea), and relaunching. Michael, Brian, and Kevin all showed up so it was nice to fly with others. Eventually we noticed the air was changing, the sea was changing, and it looked like the blown-out conditions that had been forecasted were showing up. So we landed on the beach rather than top-land and chilled out on the beach, watching the front move in. When we eventually climbed back up to the launch it was clearly blown out and the trees were waving around in a nice 50-60 kph wind. No more flying for today and we went back to the cabin for a late breakfast and storm watching. (The cabin is great for that, right on the beach with our own SE launch on the front lawn, and Partridge Island across the bay to funnel the winds in). Spent the rest of that trip to Parrsboro storm-watching, hiking on the beaches, and exploring all the Capes in the area. 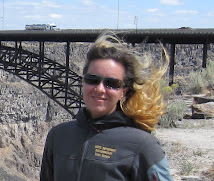 There's lots to do when it's not flyable, especially if you are into geology or paleontology. 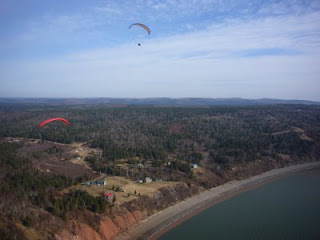 Given the winds that usually manifest around the Parrsboro area, having a speed glider would definitely be an asset for around here! We are now back in Halifax and fly back to Vancouver on Sunday. The temps have really gotten nice here but we are looking forward to some XC flying in the Fraser Valley. Big thanks to Brian for lending us his spare cabin while we were in Parrsboro! Looks like a great place, Reminds me of gulf Islands. looks like some good flying amd some great pictures.